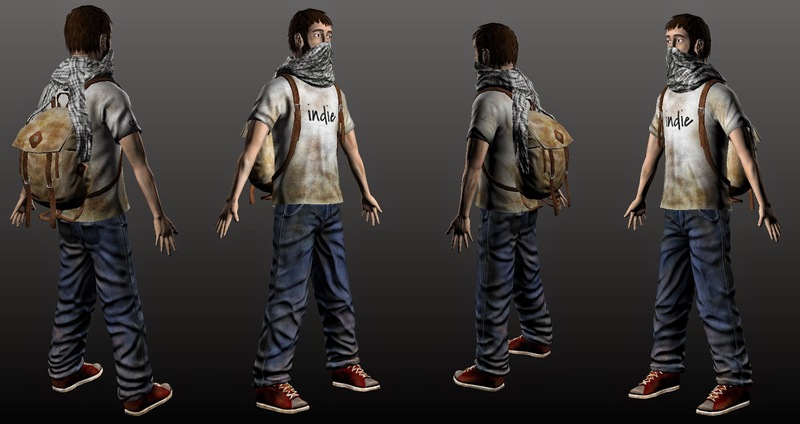 Funny how similar to Braid the main character in Schein resembles a loser. Sorry his name must have escaped me, but let's call him "Hans Wurst" - being a German/Austrian synonym for a weak, kind of nerdy guy without muscles and usually a haircut from the 90s. I don't know, is there a "Johnny Sausage" in the English language? I guess you can imagine what my thoughts centered around when I started the game and seriously,... I couldn't hold back when he told that he was searching for his son! - What? This guy... a son? Where was I? Yes, although slow, turning light sources on and off while jumping to land safely and/or to pass through objects gives the game a really unique feeling. With the exception of the main character I very much like the visuals of the game. They are simply, yet composed very well and give a great sense of atmosphere (surely) throughout the game. It is worth mentioning that the light sources also change the optics of the level within their radius. Watch closely: Even the pause menu changes depending on the light! - That for example is a small detail that made me very happy. The sound work of the game is pretty impressive as well and adds even more to the partially spooky environment you traverse through. Judging from what I have played and the map I've uncovered so far, I would guess you can easily get 4+ hours of gametime out of it. 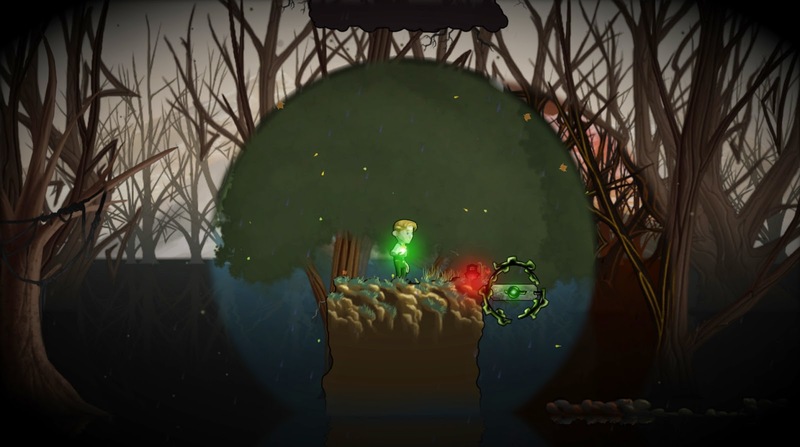 - For an indie title that alone is rather impressive but given that it doesn't look like too many areas are recycled and you actually move through new levels all the time... I sincerely have to draw my hat. Well done! So, to wrap it up: You like atmospheric but slow-pace puzzle platformers that make you think instead of trying to outrun the laws of in-game gravity? - Schein is a must for you! And I think you are even in for a treat because this game doesn't cost the world anymore on Steam. Show a bit support to some indies that made a lot right with this game and hopefully manage to get out their next IP soon! 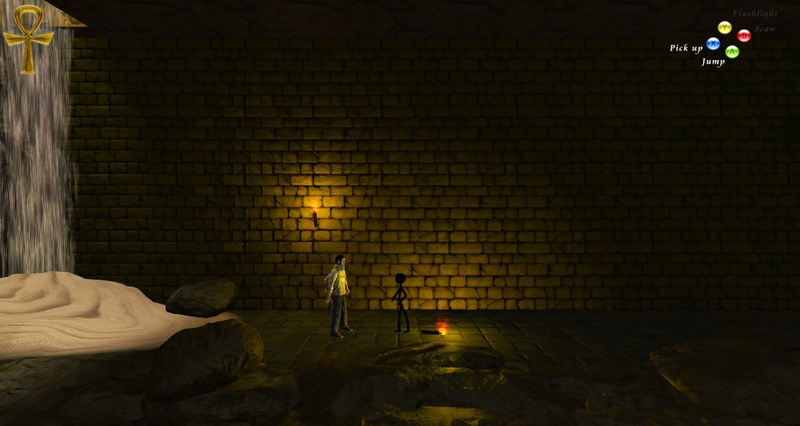 Hektor is very different from many other games at its very core; most noticeably, the game doesn't put you in a fixed or rather static environment. This is something we figured out very late in the game and I think something crucial to the whole experience. You see, in Hektor everything around you constantly changes... most definitely when you die! - but can you die in Hektor at all? I don't know. Well, not in the classical sense for sure. There's no reloading, no saving, no checkpoints - at least not for you to actively notice. You just play the game and then something happens; yes, you might get "killed" but then you will just wake up in a totally different place (kind of reminds me about what is going on in Uncanny Valley). You never have to repeat something you already did and you never feel bored running around the same routes over and over. You are just "there" and the world around you seems to have no rules or distinct patterns. True, most of the times you feel lost but as mentioned before, I think that is all part of the experience and yet somehow the game intuitively always pulls you into the right direction. The music as well as the effects in this game are definitely amongst the best I've come to known from this genre before. Just the sound in the background made me freak out countless times although nothing actually happened in the game! The optics of the game are great in my opinion although it can be argued that the constant blur and hallucinogenic fisheye vision can be annoying and is a bit over the top. There are some pills in the game but if you ask me, they never seemed to have any effect. - Maybe they should? Maybe that's a small bug? I don't know, but I think it would be great if they restored the vision to a somewhat normal state. I like most that this game keeps it as simple as possible. It's the almost classic "amnesian" approach all over again: Only a few items, manually opening doors and moving stuff, mostly focused on light sources, and so on... but even better in my opinion; in Hektor you don't have a monster that has its (more or less) fixed routes and gives you constantly a hard time just running and hiding. - Well, there is something like that in the game but... it's just too hard to explain - which is probably even better that way. Like I raised before; can you really die in this game? Something I have to emphasize greatly is that this game did a perfect job with the notes you can find: First of all there aren't too many and even more importantly ALL OF THEM are read to you!! 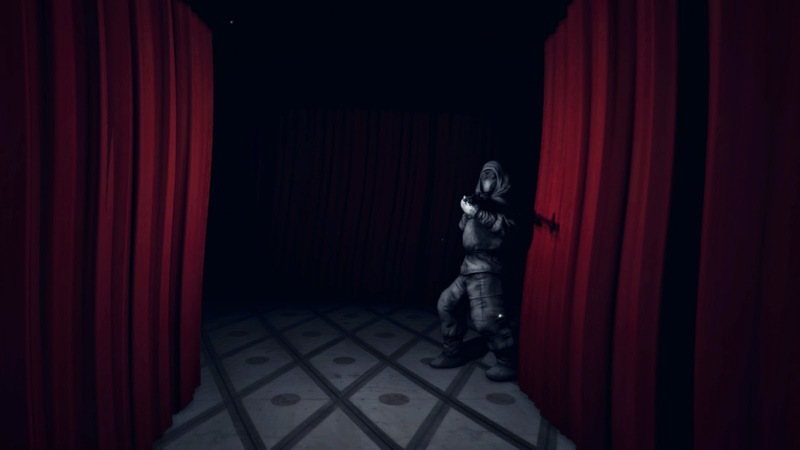 - Man I wish all the other 1st-person horror clones would do it like that. - If you can't tell a story without a million letters to find, then at least have the decency to get a voice actor and let them be read to the players! What disappointed me the most was that the ending wasn't at all what I expected. Just: "What? Now it's over? But what about...? And...?". I guess I am leaning out of the window here, but maybe the game has multiple endings or I missed something? It wouldn't surprise me. Either way, what I experienced was unfortunately rather unsatisfying to say the least. There was just nothing... all that build-up for... nothing - and that's how I left the game. It's not that I expected UFOs or whatnot, but something that would explain - well,... something. Doesn't matter... playing the game was a really great and horrific experience. The developers made the monsters more or less right and scary, the atmosphere was great, the music added-up significantly and personally I felt a bit like really losing my mind over this crazy conception of a world without patterns. Yeah, the game was also short - really short, with about three hours of playtime. But then again, also that can be good sometimes; sometimes - like on this last evening - we would rather play something that can be finished on one evening instead of a whole night or several session, for which we anyway barely have the time. 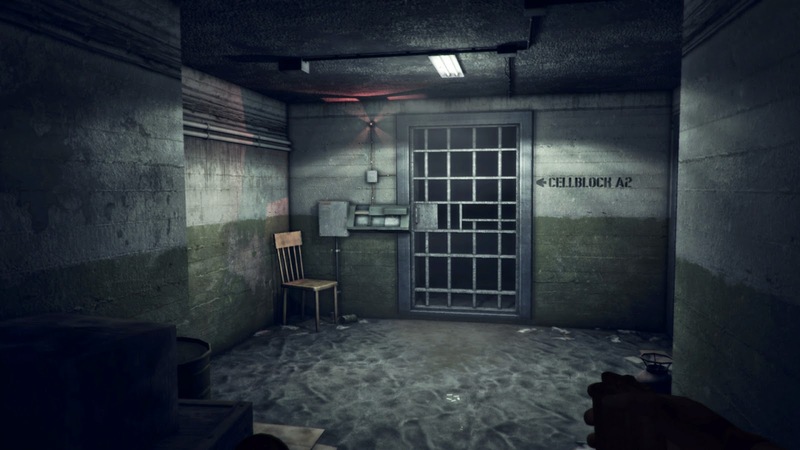 Hektor is a great mixture of the better parts from games like Amnesia, Outlast and probably The Stanley Parable and I am pretty sure they even stole some curtains from the set of a David Lynch movie. Don't wait, check it out! First of all it is beautiful! Seriously, I think I haven't seen a 2D game with such beautiful and artistic graphics. There are ridiculously many details and every single screen is a perfect composition of color and atmosphere. And everything is moving too! - I mean like, when the character runs besides some veins or blades of grass for example. There is so much life in this game, I don't know how else to put it. Secondly, the game's mechanics and especially the controls are remarkable. I think haven't had so much fun running and jumping around in a 2D game for quite some time. Everything related to the movement feels natural and intuitive. Not to forget the love for detail again; what was the last game you played where you could crouch and then jump and the character would make a backflip for example? I think for me that goes even back to Super Mario 64. What surprised me very much in Ori was the bashing ability. I didn't expect something like that in the game but it adds a lot more depth to movements and abilities we are already familiar with. I am not sure if this is an original idea but because I can't remember using something like this in that particular way and because it caught me off guard, it certainly feels original and refreshing. Well, I guess... it's time to take out the red marker and get a bit more critical now, because although I really love the game and it is worth way more than what you're paying for it there are some things I personally didn't like along the way. The difficulty for starters. Yes, it is true - I am constantly longing for something challenging, but as I said before, approximately the last third of the game is simply too hard in my opinion. Not only that the maps become filled with more and more instant-death zones (spikes on the walls... and basically everywhere else), the cocktails of maneuvers you need to mix (like bashing + grabbing + double-jumping + wall-running + triple-jumping + gliding + dodging and let's not forget shooting) become a bit too crazy for my taste. But ok, maybe I am not used to such a high level of gameplay anymore. Either way, the main problems this game has in my opinion is 1. that it doesn't have difficulty settings and 2. which kind of goes along, that the upgrades you "buy" for the character hardly ever seem to pay off - at least the active ones. Naturally a game is supposed to get harder, but I was under the constant impression that it really doesn't matter if I had Spirit Flame version 1 or version 3. And it also didn't matter if I had (I think) all the 15 hearts/green things/life orbs - whatever - or just three of them. You see, on the beginning of the game an enemy deals like 1 point of damage. If you have 3 life orbs (HP), you can take three hits. That sounds reasonable, right? But at the end of the game, let's say an enemy deals 5 points of damage instead. Well, that's kind of a bummer if you are only having like 12 HP. - Especially considering that there is hardly ever only one enemy around you. I don't know - I guess purposely - the game is scaling proportionally and thus keeping it constantly hard... which is perfectly fine from one side, but I can't help myself but to miss the point where a game satisfies you by becoming somewhat measurably stronger. You know, kind of as a reward for trying and being ambitious to find all the stuff that is hidden and supposed to make you stronger. "Metroidvania" is a term that always falls when people talk about Ori... so what was different in Super Metroid for example? - Energy Tanks! Hidden very well but immensely powerful in a sense that they really increased your survivability and made you sustain even stronger enemies and longer battles. In Ori it just doesn't feel like that. The later enemies kill you as fast as the first ones while the later battles also all have the same duration like the ones at the beginning. So, without alienating the players across the board, I think there would have been several ways to approach that issue; one for example being the reuse of "earlier" enemies and putting them in the advances regions as well. But the better approach might be to add global difficulty settings. Another crucial thing that not entirely lived up to my expectations is the map. First of all the zoom is wrong in my opinion, because you can't zoom out to see all of the map - the real map that is. The game lets you zoom out a bit but then it suddenly cuts to the painted map of the forest, which besides being beautiful and probably necessary for the plot - as in: the bigger picture - isn't really useful at all. But there is actually more to the map - or rather to the whole "metroidvania" backtrack/exploration feeling of the game in a whole... This is undoubtedly a difficult point to discuss or even to put to words, because it surely is not easy to make a map like in Super Metroid or Castlevania Symphony of the Night for example. 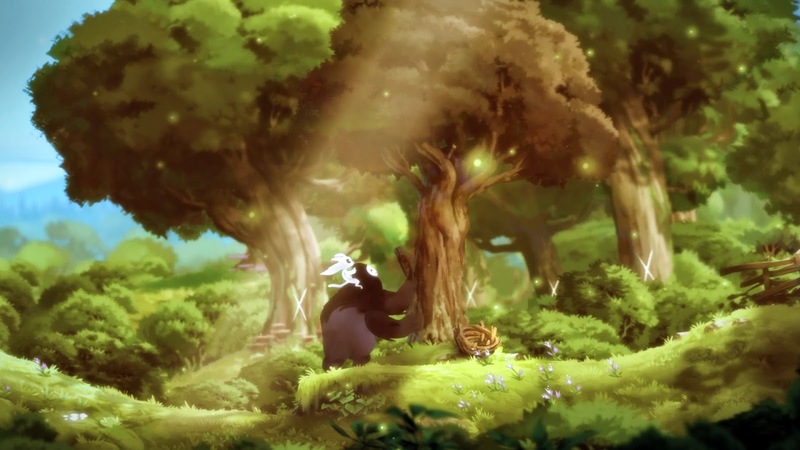 Ultimately the question should be what those games did right, but then again; would it be fair to constantly compare Ori and the Blind Forest with them? I don't know... at the end of the day however I can't ignore the feeling that the map - or maybe "world" is the better word - in Ori is rather small. Yes there are many different locations but the feeling persists that you are trapped in a really "small" forest where everything somehow looks similar and everything forms a total harmonic whole. Why - at least to me - is this not the case in Symphony of the Night for example? There you are just in one, single castle - even smaller than a forest and most certainly whole as well! I am not saying Ori did something wrong, I just find this absolutely interesting. Can it be that the optics in Ori are on such a high level that it becomes almost impossible to perceive the variety? - That the transitions from area to area are maybe a bit too soft? Or a combination of that and some sort of unconscious repression of the areas we didn't like too much? - In my case that would be the Forlon Ruins for example... ah, apropos map and such; the Forlon Ruins is also an area where you obviously can't get back in after you escaped it. So, try to get everything there or else you might be disappointed because you couldn't collect everything in the game! - Yep, I am sorry to say but there is also no free roaming after you've completed the game... actually you can't even load the game and watch the ending again. Saving in Ori is also an issue. Well, not a bad one, but it certainly is... different. When I first heard about this game I thought there will be special places/portals or rooms where you can save the game (also similar to Metroid & Co), but it turned out that Ori more or less only relies on some sort of quick-save feature, although those save portals actually exist as well. If you ask me, I would bet that this wasn't intended originally. But given the fact how easy you get killed, my guess is that they came to the conclusion that the game would be too frustrating without it. - And rightfully so, seriously! Oh how I hated it when I was kind of "in the zone" but I forgot to quick-save and then got killed completely unexpectedly. It is a shame that at least my approach went in the direction of saving after each single pit or enemy cluster thus completely destroying the "in the zone" feeling... in a way that is even worse than automatic checkpoints. Man... I feel like unintentionally tearing this game into pieces! Ok, one more thing and I am really done: The soundtrack. Sorry, but although it is very well arranged and more or less fits to the game, I expected more. The main theme is very nice and I like the variations of it but except that there is no iconic melody or theme that gets stuck in your head. Have you tried listening to the full soundtrack on youtube for example? It's just boring for the biggest part and I am sure after 15 minutes you will also just turn it off. Where is the catchy stuff? - The rythmic pieces every platformer needs? Alright, now I'm done. Please don't get a negative impression of this game because the game is superb! Rightfully this game has good chances to become crowned with multiple awards in 2015 - maybe even becoming game of the year. It is an awesome experience in terms of gameplay combined with a moving story as well as a tribute to the good old days of gaming, while showing the industry that with dedication and people who know what they are doing new and smaller ideas can be way more profitable and appreciated than the 17th sequel of an established franchise. The world needs many more Oris! I am looking forward to playing another run - this time clearing the Forlon Ruins - and mostly having fun all over again. If you are still thinking about getting the game or not: Don't think anymore and just get it! DO SCHNITZEL AND GAMES REALLY GO ALONG? Shortly before Easter I attended a public discussion @subotron in Vienna dealing with important questions about the Austrian gaming industry. In case you are my usual reader from abroad: Subotron is one of the few associations in Austria trying to push and make leaps for the local gaming industry. Mostly based on open discussions they constantly pull off events that are educational, promotional and interesting for students and industry members alike. - Among other growing organizations and communities, Subotron might as well be right at the center of videogame culture and computer related art in Austria if you will. I found this evening particularly interesting because it was more or less centered around Thomas Mahler (the creator of Ori and the Blind Forest) or rather certain comments he made about the state of the gaming industry in Austria. - Essentially that there isn't one, because although there are games being made in Austria, none of them (subjectively speaking) qualifies as a "good" game because in order to make a good - or rather an internationally successful - game; here you can neither find the necessary talent nor the financial support you would need. In a way I agree, but the controversial nature of this statement, the reactions from local studios and how the press handled it was not the only reason I attended and wanted to hear more. I was also there because I am currently playing Ori and I am naturally working on a review where I wanted to include some elements of the discussion, if possible. - Believe it or not, but it doesn't happen quite that often that an internationally top-selling and highly appreciated game is "made in Austria" or... "from a guy from Austria"... or whatever the correct label is. In a way Thomas Mahler currently is a star, maybe a sub-cultural one, but I guess that qualifies. For people from this country - like myself - it is a rare pleasure to shake the hand of such a person, to see how he is in reality and to listen to what he has to say in person instead of staring at a monitor. I expected a mudslinging, seriously! Because as it is most of the times; where there are those that literally idolize you, there are also those that condemn you because envy always comes before rationality. Or was it arrogance that comes before envy? Anyway, very soon statements are made, twisted and people get pissed off. Misunderstanding leads to accusation, accusations lead to a defensive position, defense turns into attack and the hateful, despicable fight is preprogrammed. A lite version of something like that happened in Austria some weeks before the release of Ori and to make one thing clear: I am not defending a statement that even makes me look like an idiot in what I am doing as the small indie guy I try to be. But I have to admit that I agree to a certain point and above all I appreciate statements like this in the way that they cause ripples and that the lead to great discussions like this recent one, where a bigger part of the people that have something to say about videogames in Austria is present and issues publically surface that usually nobody dares to speak out loud. Yes, there were some moments, some aggressive statements and as always a few unfounded comments, but for the most part - I would say 99% - this evening was absolutely civilized and informative. The expected mudslinging, which almost tempted me to bring some popcorn, didn't take place. Instead I found myself surrounded by many, really smart people who without exception not only knew what they were talking about but also surprised me deeply. The debate spread to several different questions like: Is it good to hire only the best people to make a game versus who takes care of the diamonds in a rough? Is it really true that you can't find the people you need - the best people - for your game in Austria? If so, who's fault is that? - Is it because the educational system doesn't produce quality standards in Austria? Is it because we are Austrians after all - meaning that we all sit on our royal asses and wait for everything to come to us instead of working really hard? Or is it because there really is no foundation that allows for quality here because ultimately it costs money and tragically Austrian companies aren't getting real support from the government and/or economical institutions but are instead confronted with every possible stone "they" can put in their way? Those are some of the core issues right there and although questions like that can't be answered over night, people started to reflect them! Videogames is a business. It's an awful hard job and I would not be surprised if in some years studies will surface showing how people working in this field endangered their health and shortened their lifespan due to the constant stress and pressure they are exposed to. - Actually no, I take that back, I would bet such studies already exist abundantly. I guess making videogames being hard as well as being a business is one thing all the parties agreed. At some point however I missed the mutual consent that in that regard it doesn't really matter whether you make a (subjectively) "not so cool" f2p browser game or a "highly meta-critiqued" console game. It doesn't matter if you work with four people across the globe or with 80 local employees you have to pay every month and thus give the government probably more than they deserve for giving you not the least bit of support, although you are actually pushing an industry with a bright future, locally accumulating know-how and so on. It doesn't matter in the sense of people working under pressure, of resources being managed and sacrifices made. Ultimately - because there are damn smart people behind it - I wouldn't doubt that usually the best possible thing is created from the options available. Videogames is a business... and a lot of different game studios use different business models for their games. There is nothing wrong with dissecting a target audience and making games especially for them. But logically the level of success becomes as subjective as the answer to the question of the result being good. If the final product sells according to the expectations and in the meantime generates enough money to actually help local programmers, artist and designers, if it supplies jobs and therefore raises the quality - the skills of every employee - long-term, there should be nothing to criticize on that. The question is just how far you can really boost quality if you only produce what makes your company survive instead of pushing yourself. I honestly believe that Mahler is seeing this not in any other way. As I said before, statements tend to get twisted and sometimes debates circle around one improper articulation longer than necessary. But you have to ask the question if something is good! This is in our nature. It's what drives economy and ultimately ensures quality. We, especially as the people tied to this contemporarily supreme form of entertainment, have to ask us that question every day! And believe me; we will have to ask it even more in the future because more and more games are produced on a daily basis. It's like economy class 101: Only the good stuff will make it and the rest will perish! Actually, I like that thought because in a nonbiased environment good would be determined by the people - by the market. Unfortunately we all know that we are not living in such an environment and that mighty marketing mechanisms almost have us at the point where they can shove everything down our throats. Good or bad has long become an artificial label rather than being a common and reasonable concept. Like I said, in a sense I agree with Mahler. He wants to push people. He has come under some "lite" version of an attack but surely unjustly marked as arrogant because he banged his fist on the table and told the people to wake up. If you - if we as Austria - really want to be part of this game, we need to rethink our conceptions of what is good. All the micro-economical necessities like paychecks aside, we need to push the visions rather than the more or less safe perspectives. This is an international game and we need to think bigger. What is good for the Austrian or the German market for example is not enough if you want to sit in on this table. Please forget those borders and somebody do a leap of faith. Just be honest to yourself; Isn't there some truth in what Mahler also said - roughly quoted but surely contextually right as - "A game is good when it will be remembered even 20 years from now". Nobody will remember the next Call of Duty or the next Assassin's Creed. - Heck, I can't even tell the individual games of those franchises apart anymore. And internationally!, most certainly nobody will remember a game like Mein Gestüt. 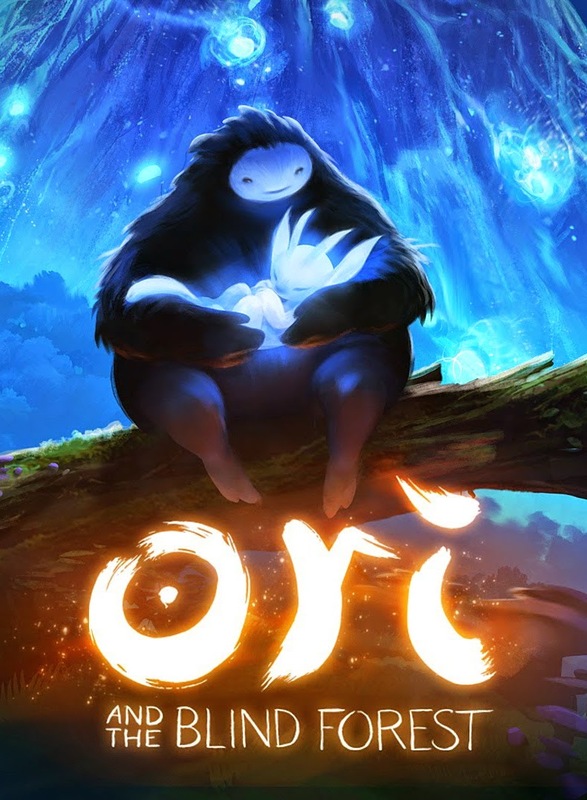 It doesn't matter if you are a programmer, a designer, a CEO, a tester, a writer or a student,... if you listen carefully to what your heart is telling you, wouldn't you rather work on a game like Ori instead of some mere excuse of a game like *insert 90% and rising of any f2p, premium, advertisement-packed mobile title*? In the end you have to do what makes you happy, right? Jobs in this industry are so tough that you need at least that. And we are all forever 16 too... In a way even the simplest games can make us happy and I can quite good imagine that working on Skyrama was a ton of fun for example. Then again, there is more; something everlasting, a chance to be part of something bigger and to help create a true legacy of videogames, because next to entertainment and business above all it is and should be one thing: art! I know that there are pages reserved for Austria in this book of videogame history... I just hope that by now it is perfectly clear that those pages will not be filled by games produced with the sole intent of "employing 80 people" or "being able to write paychecks". I am certain that we have to do better than that but also that we can make it. Do we need support? Do things have to change? Do we need better people? Do we need to encourage and train more people? Do we need a stronger community? Do we all need to march the streets in front of the government buildings and scream out lout that nonwage labor costs, among other policies, are ridiculous in this country? Do we need to take a leap of faith and take a risk? - Yes, I think we need! Above all I think we have to continue to make games, to give our best and to work together. I have played and "played" creating games for so long, always trying to put an eye on the industry in Austria. Honestly, I didn't see too much. I liked to think that's because I also have higher standards but maybe I just wasn't looking good enough... Anyway, I can see it now; more and more communities are forming, the media is jumping in and games are coming from both the industry and indies. Be it Ori and the Blind Forest from Moon Studios, A Fragment of Her from Chronerion, Legacy Quest from Socialspiel or Shadowrun Online from Cliffhanger and many, many more - the things are happening! My biggest hope however lies in that GamesAustria will really become a great, open and impartial platform for us all to pull on the same string. That we can finally have a community where everyone is accepted and every single keyboard junky and artist is encouraged to get out of his or her basement and realizes the opportunity to show their work to people who welcome it. I have no illusions, it's not going to be easy, but if we all work hard things will change. And that's my cue,... if I took one thing with me from that evening it's motivation. I don't really know how much more I can put into this, into Phi, into my other prototypes, into a good portfolio and reading even more, because honestly I am on the limit already. But alright, I get the message. I will work even harder. I don’t care. If that’s what it takes to get at least some attention, to get at least those feedbacks that tell me I am doing garbage so I can really improve… My financial reserves should keep me going till the end of May and then we will see. But I am certainly not going to resign to the Lagerhäuser, the only buildings higher than churches in my surroundings, constantly and symbolically laughing down and postulating that in Austria you can’t be anything else than a farmer. Well, here it is now completely finished! I had to make a lot of small corrections and making the textures was a lot of fun. As always, it is possible to get even more out of it. However I already tested it in the game - or what is there at this point - and I think it is quite enough. Also I have to keep in mind that I am working all alone on something that is way bigger than me and I have to manage my resources - in other words: the time I spend on different tasks on this journey. All in all I think Daniel looks like the semi-adventurous average guy I was going for. I wanted to give him some extra features like a watch or a necklace maybe, but besides more additional work it wouldn't have changed too much, so I dropped it. Ultimately I had way more questions than answers and there are still some unanswered things left to test and find out, but in general I think I have a good basic understanding of the topic. - If you find yourself in a similar position and you even have the same questions, please don't hesitate on contacting and asking me, I would be glad to be of help. Applause to Unity again! Seriously, I was expecting way more obstacles and difficulties. 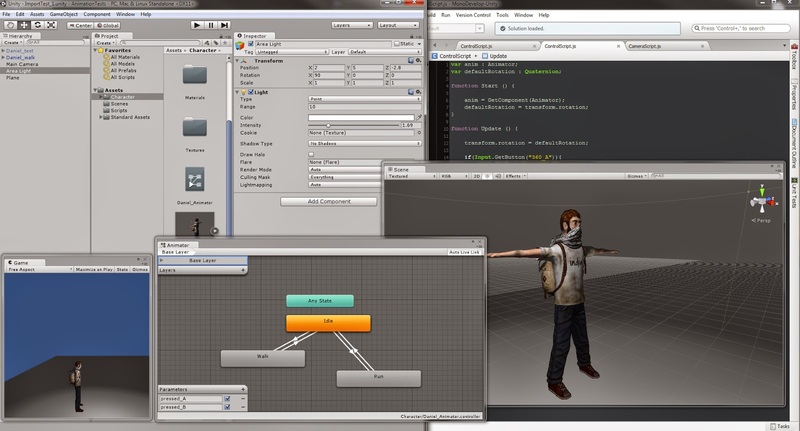 After these last days of "playing" with it, I think Unity's animation pipeline is great. It is super powerful and as always super easy and intuitive to get started with. Go into the animations, select the "mask" option and activate those bones under "transitions" as well! 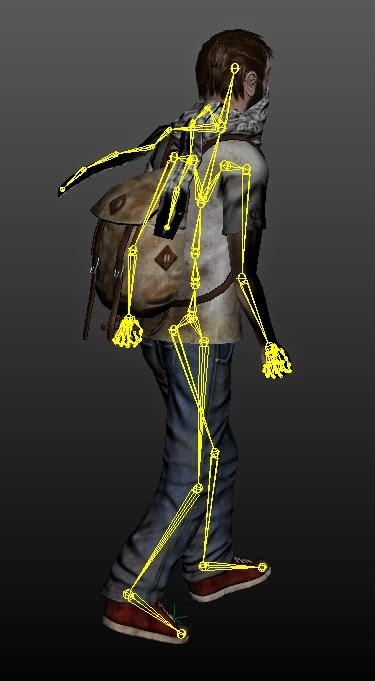 - It took me like forever to get the scarf animated and I could find nothing on the internet about this, but then I realized that those bones were completely deactivated/unmasked and that explained why the scarf wasn't moving as I animated it, while everything else worked fine. In the end I was able to produce this small test scene where Daniel has three animations (walk, run and idle) on him and transitions/blend between them. - Please keep in mind that I did the animations just pretty roughly for testing purposes and they are all to be redone and improved significantly from now on. The test scene looks a bit different from the game, but as I said, it's just to give me an idea and a similar test environment. So, yeah... I think you can imagine that from now on it is all about animations, animations and animations. - Man, Daniel is supposed to have a ton of them! This is sure going to take some time. I am calculating with about a month for all of them, but then again, I also need to test them out continuously, see how they work together and thus postpone some animations like "open chest" or "swim" completely to be able to progress a bit faster. Besides animating - or actually before that - there is another more or less difficult task I really need to in the next time: Change to Unity5! What, why haven't you already? - Just because! But damn is Unity5 awesome, or what? It really is about time to get there. Also the new features for example getting free access to all the lighting/shadow features... wow! I can't wait. But then again, I also don't know how much of my game can really be "transferred" without problems to the new system. Apropos shadows... did you see the shadow Daniel is casting? If you wonder how I did that (in Unity4, where there were basically no shadows in the free version) message me over the various social platform and I will tell you. ;) It's actually just one line of code and with a bit finesse you can actually make a nice shadow effect. Not that Unity4 is an issue anymore... but I am proud of this small trick nevertheless. I wish you all a good day and happy game developing! Ah, and also Happy Easter or whatever you are celebrating this weekend. Did I tell you that I hate getting and eating bags full of cooked eggs?